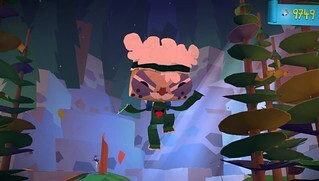 Even though Tearaway is a single-player game — a personal journey shared by you, and your little messenger friend, iota or atoi — we couldn’t resist giving Tearaway players the chance to express themselves creatively. 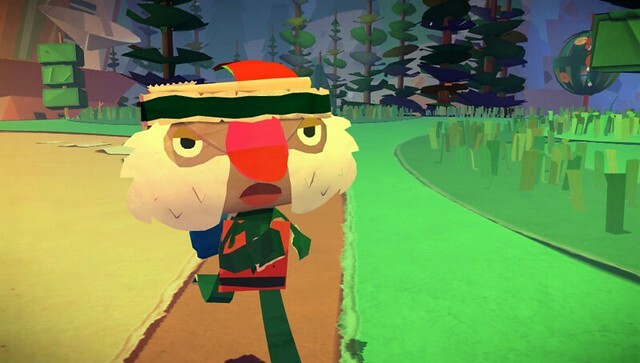 We’ve already talked at length about the oodles of papercraft models you can collect as you play through the game, but there are also in-game challenges that will allow you to personalize the world as you travel through it. A squirrel who needs a new crown, a chap whose moustache has been stolen by crows, and a pig that’s too ugly… these are all examples of problems you’ll be asked to solve through the cutting out of virtual paper shapes. When the time comes to get crafty, you’ll be presented with a virtual cutting mat, and a selection of colored paper sheets. Using the pencil tool, you can trace a shape that you want to cut out using the front touch. If you make a mistake, you can erase your flawed pencil lines with the eraser tool, but once you’re happy with the shape, hit the scissors icon to cut it out. You can layer multiple sheets on top of one another, just like using real paper, and once you’re happy with your decoration, you can save it into your collection. Now you can use it to decorate certain things in the world, and bring a smile to unattractive pigs everywhere. Most importantly of all, you can customize your papery messenger. You can remove any or all of their features and replace them with whatever you like, either choosing from a list of pre-made animated items such as eyes, mouths, and various shapes like hearts or stars, or you can make your own from scratch. The pre-made ones must be purchased with confetti, colourful paper fragments that you’ll collect as you play, but making your own is free! We’ll be working on releasing some extra decorations later down the road, too. The whole process is pretty similar to convincing someone to hold still whilst you glue paper all over their face, except you can also peel off their existing features too (eww). 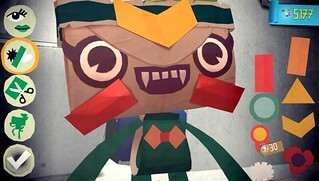 Tearaway launches for PS Vita on November 22nd, and you can pre order now. Man, this looks great. Glad you guys still have lots of features to show off. Definitely looking forward to it. You guys are something else. Loving the muttonchops. I have a feeling that I’ll spend way too much time in creation mode. One of my most anticipated games. wish this game came out ayear ago. Gonna be to busy with PS4 and all the PS3 releases along with all the Vita games I’m still playing to bother with this. Wow, this sounds pretty cool. Cool :). Cannot wait until this baby hits store shelves :D! Cannot wait to get this game. Have a question though. Is this game strictly linear? 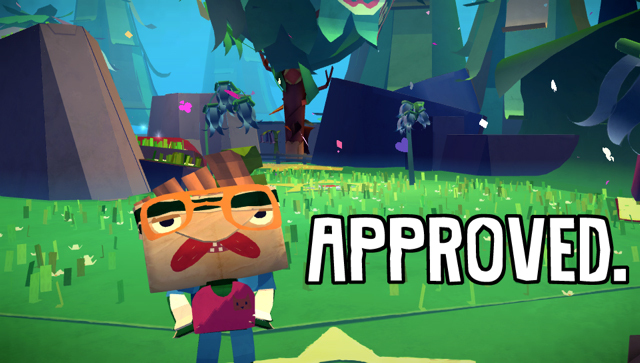 Is it sort of hub-world like the 3D platformers of PS1 a la Spryo and Crash? Or is it open world? Will be picking up regardless. Looks fantastic. I will therefore wait for news on a digital release of this game. Can we preorder on the PS Store? Looks like a fun game. 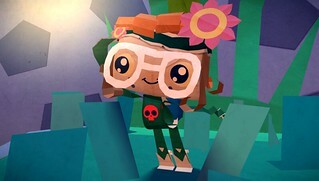 I’ve been excited for Tearaway since August 2012, when announced. The game looks great. November 22nd is almost here! 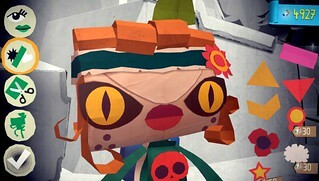 OMG I cant wait for Tearaway anymore….Mm you guys are the most creative minds in the industry. I still don’t see any of the pre-order bonuses at Canadian retailers. @10: They said that there are two kinds of areas. Linear ones, which are the more ‘action’ oriented ones. And then open “playbox” type areas, where you can do whatever with all the things around you. I didn’t explain it very well, but they’ve definitely talked about it before. Can’t remember where exactly though. its in trouble bc while we ps fan love it they still need to give a reason for the general public to like it and actually buy it. which means they need franchises the ppl know and love in order for them have an excuse to buy it.